Synthetic peptide, corresponding to amino acids 485-501 of Human BACE. The peptide sequence differs fromthose of mouse and rat BACE by one amino acid (1). Shipped at 4°C. Store at +4°C short term (1-2 weeks). Upon delivery aliquot. Store at -20°C. Avoid freeze / thaw cycle. Stable for 12 months at -20°C. BACE Antibody is Ion exchange chromatography purified. Our Abpromise guarantee covers the use of ab2077 in the following tested applications. ICC Use a concentration of 10 µg/ml. WB Use a concentration of 1 µg/ml. Detects a band of approximately 70 kDa.Can be blocked with BACE1 peptide (ab7883). We recommend overnight incubation at 4C and using 5% skim milk to block. IHC-P Use a concentration of 2.5 µg/ml. Immunocytochemical analysis of NIH/3T3 cells, labeling BACE1 with ab2077 (20µg/ml). Immunohistochemistry of BACE in mouse brain tissue with BACE antibody at 2.5 µg/ml. 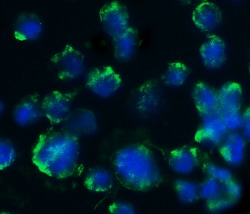 Immunocytochemistry/ Immunofluorescence - Anti-BACE1 antibody (ab2077)Image courtesy of an anonymous Abreview. ab2077 staining BACE1 in human glioblastoma cell line D54MG by Immunocytochemistry/ Immunofluorescence. Cells were fixed in paraformaldehyde, permeabilized with 0.1% Triton X-100, blocked with 0.5% BSA for 20 minutes at room temperature, then incubated with ab2077 at a 1/50 dilution for 16 hours at 4°C. The secondary used was a TRITC conjugated goat anti-rabbit polyclonal, used at a 1/400 dilution. Nuclei are counterstained with DAPI. 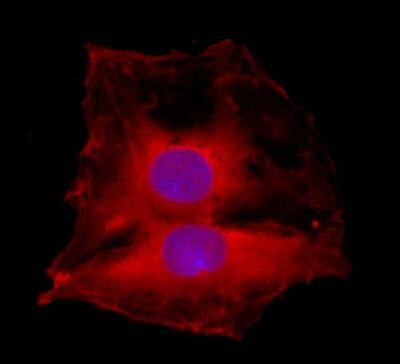 ab2077 staining BACE1 in rat glioma cell line C6 by Immunocytochemistry/ Immunofluorescence. Cells were fixed in paraformaldehyde, permeabilized using 0.1% Triton X-100, blocked with 0.5% BSA for 20 minutes at room temperature, then incubated with ab2077 at a 1/50 dilution for 16 hours at 4°C. The secondary used was a TRITC conjugated goat anti-rabbit polyclonal, used at a 1/400 dilution. 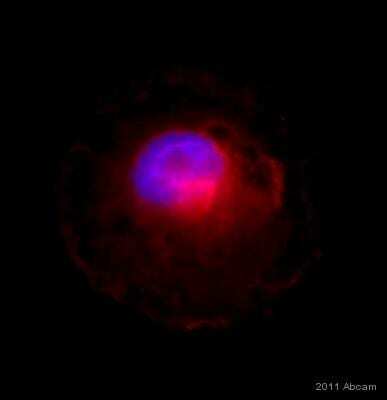 Nuclei are counterstained with DAPI. Publishing research using ab2077? Please let us know so that we can cite the reference in this datasheet. Our customer has also requested for a credit note for this one too. Appreciate your time and if you could kindly organise this for us. Your credit note ID is xxxxx. Could you please confirm if a loading control was included and what the results were? A loading control assures that the samples used are of good quality. My positive control were SH-SY5Y and mice brain lysate (30ug/well). As you know both are neurons and have plenty amount of BACE1. 2. We have some data that suggest that the BACE1 protein is difficult to transfer to the membrane in WB application. I would appreciate if you could confirm if the transfer of protein onto the membrane was assessed and what was the result? I have been working on BACE1 for more than 3 years, and I think this question is not true and accepteptable. Our all secondary antibody have been already optimized and they are working very well with 1:3000 dilution. I am sorry to confirm that we can not make any further suggestions in this case to improve the results. It seems that you regrettably received a bad vial. For that reason I would be pleased to arrange a refund, credit note or free of charge replacement in compensation. Inquiry: Hi Technical, We have a customer who is experiencing problems with this antibody. Please find attached the customer's questionnaire. Thank you for taking the time to complete our questionnaire and contact us. I am sorry to hear you have had difficulty obtaining satisfactory results from our Anti-BACE1 antibody (ab2077) . I would like to reassure you that ab2077 is tested and covered by our 6 month guarantee for use in WB and mouse as well as human samples. In the event that a product is not functioning in the applications cited on the product data sheet, we will be pleased to provide a credit note or free of charge replacement. Regrettably reviewing all the details there are not many suggestions we can make to improve the protocol. However, I would like to investigate the case a bit further for you. Before deciding how to proceed with this particular case, I would appreciate if you can confirm some details of the procedure. 1. Could you please confirm if a loading control was included and what the results were? A loading control assures that the samples used are of good quality. 2. We have some data that suggest that the BACE1 protein is difficult to transfer to the membrane in WB application. I would appreciate if you could confirm if the transfer of protein onto the membrane was assased and what was the result? 3. Could you confirm the isotype that is recognised by the secondary antibody and weather it is known to work well with other primary antibodies? Thank you very much for your cooperation. Please do not hesitate to contact me again with the further requested details. I look forward to your answer and am sure we will be able to find a solution. The ab2077 I have was giving the expected signal for my past several lysates. To verify the exact band, since I was getting one at approx 70 and another at approx 55/60, I used the mouse lysate. The strong band at 100 kD for the mouse lysate was unexpected and confusing, leading me to believe the mouse lysate wasn't good. I thought running it again with the mouse lysate in the middle of the gel might clarify where the positive control was appearing. I also thought that even if I ran this again with a new vial of ab2077, I still wouldn't have a positive control to verify my band (and appease future reviewers). Having said that, perhaps you're right that I should at least try another ab2077. I'd rather do that then try a different primary antibody. So, go ahead and send a new ab2077. If I get the same thing, then I'll have to decide how to proceed to verify that the bands I'm seeing are indeed the glycosylated and non-glycosylated forms for BACE1. I am sending you a new vial of ab2077, your new order number is ** and you should have the new antibody by 10.30am tomorrow morning. If there is anything else I can help you with, or if you have any issues with the new vial of the antibody please let me know. I hope your experiments go well. I understand that you can't send all the reagents, but I've been working on this project for too long to quit. I don't think anything's wrong with the ab2077 antibody. Would you be able to send me only the 3T3 lysate? I need 30 ul to run at least 2 lanes. If that works, then I'll order (and pay for) more ab2077 to run the experiment to completion. If sending you a new aliquot of the cell lysate would help you to complete your experiments, then I would be happy to do so. However, I am confused as to why you think that the current vial of ab2077 that you have is ok when it is not giving the expected signal. I was hoping that if I send you a different antibody against the same target, then you would be able to detect your band of interest. As I mentioned previously, I would be happy to send a new vial of cell lysate, I just wanted to confirm with you the course of action that you wish to take and to double check that you did not want to try a different primary antibody. Thanks for your response. For some reason the email I sent a couple days ago bounced back. Please see attached an overlay of the ECL image with the Marker image. It definitely seems like there are two bands (between 75 kD and 50 kD) that correspond with the BACE1 protein. Specifically, one at approx 70 kD and one at approx 56 kD. Based on the data sheets you sent me, the 70 kD band is probably the glycosylated form and the smaller approx 56 band might be the unglycosylated form. It is strange that the mouse lysate appears in the 100 kD area, but there seems to be a faint band in the 3T3 lanes at approx 56 kD. I need to re-run this in the middle of a gel to be sure, but I need more lysate. I'm not ready to jump ship and go with a different company. Is there another positive control you'd recommend? Also, since the peptide hasn't worked, I'm guessing the batch was somehow bad. I also think I should try a new BACE1 antibody along with the ab2077 I still have. So, can you please send me the following: 1) peptide ab7883, 2) either a different positive control or more of the mouse lysate 3T3 (at least 40ul), 3) ab108394 (since perhaps a monoclonal Ab would decrease the non-specific bands I'm seeing). I am sorry about the issues you have been having with ab2077 in western blot. I cannot send you all of the reagents that you are requesting, I can either send 1 free antibody as a replacement for ab2077, or I can process a refund for the cost of the original purchase. Thank you for calling Abcam yesterday. I am sorry about the issues you have been having with ab2077 in western blot. Having talked to my colleagues, I think the best way to move forward with this is to either replace the antibody that you currently have or to refund the cost of the original purchase. I do not think that there are any protocol tips that I could give that would help resolve the banding pattern that you are seeing and can only assume that the vial of ab2077 that you received is not working correctly. If either of these antibodies would work for you (or if there is another BACE1 antibody that you would like to try), please let me know and I will be happy to send it out to you. Thank you for confirming these details and for your cooperation. The details provided enable us to closely monitor the quality of our products. I am sorry this product did not perform as stated on the datasheet and for the inconvenience this has caused. As requested, I have issued the free of charge blocking peptide for this product with the order number I have also included our protocol for blocking with the immunizing peptide for your review. To check the status of the order please contact our Customer Service team and reference this number. Please note that this free of charge replacement vial is also covered by our Abpromise guarantee. Should you still be experiencing difficulties, or if you have any further questions, please do not hesitate to let us know. I wish you the best of luck with your research.